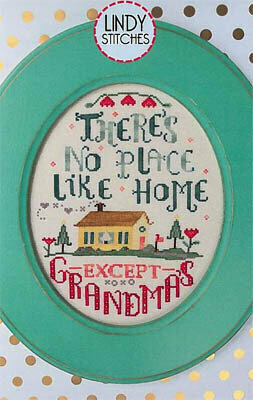 "There's no place like home except Grandmas" stitched over 2 threads on 28 Ct. Light Mocha linen. Stitch Count: 86W x 108H. Pillow model stitched over 2 threads on 28 Ct. Lavender Mist linen (or similar fabric). Stitch Count: 65W x 65H. Both models use Gentle Art Sampler threads (or DMC 470, 761, 3685, 3051, 502, 778, 930, 712, 3810, 899, 3803, 415, 598). Comes with a heart charm. Framed model stitched over 2 threads on 32 Ct. Amber linen. Stitch Count: 94W x 91H. Pillow Model stitched over 2 threads on 28 Ct. Antique Tan Linen. Stitch Count: 90W x 65H. 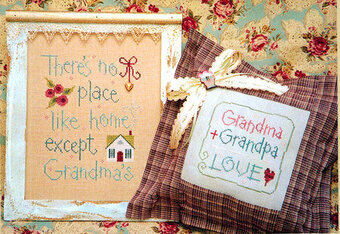 Both designs use Gentle Art Sampler threads (or DMC floss 322, 341, 931, 930, 712, 470, 3051, 899, 3803). Comes with heart and bow charms. 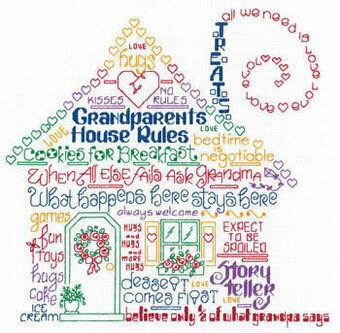 "What happens at grandma's, stays at grandma's!" 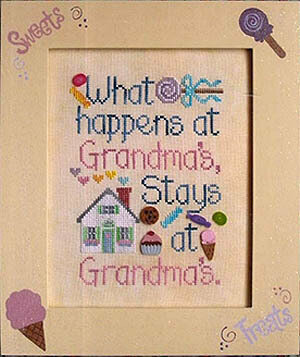 Model stitched on 28 Ct. Willow Lugana from Picture This Plus with Gentle Art Sampler threads. DMC Equivalents provided (3846 598 3825 727 954 322 341 356 962 209 414 422 420 white). Stitch Count: 100H x 73W. Buttons from Just Another Button Company sold separately. 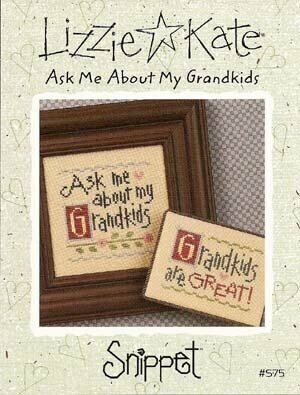 "Grandkids - the best part of growing old." Model stitched over 2 threads on 28 Ct. Ivory Jobelan with DMC floss, Classic Colorworks floss & Weeks Dye Works floss (or DMC 3750, 932, 931, 3687, 3363). Stitch Count: 54H x 74W. Model stitched on 28 Ct. Lambswool Jobelan using Gentle Arts Threads. Stitch count 84x56. Model stitched on 28ct. Dirty Linen Cashel using DMC floss. Stitch count: 143w x 137h. Models stitched on 28ct. Light Mocha Cashel Linen using Weeks Dye Works Threads (Chesapeake, Honeysuckle, Raspberry) and Gentle Arts Sampler Threads (Liberty, Shutter Green, Victorian Pink). "Ask Me" stitch count: 50w x 50h. 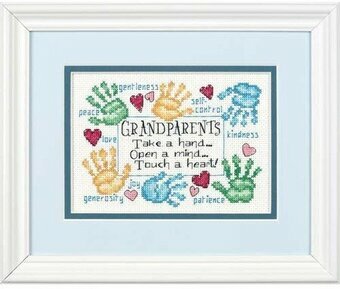 "Grandkids are Great" stitch count: 48w x 34h. "A little lass sat in the ingle-nook, with needle in hand, and an earnest look. Working away like the busiest bee, counting her stitches, one, two, three... 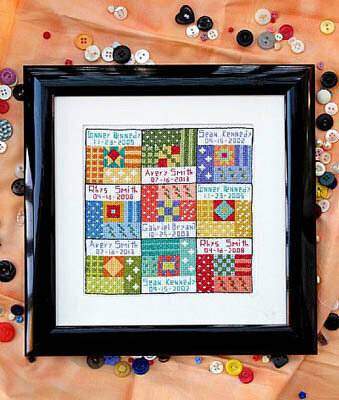 Sorting the colors, bright and gay as she trilled a tune in a happy way. "What are you doing, dear?" I said. Up flashed the pretty, golden head. 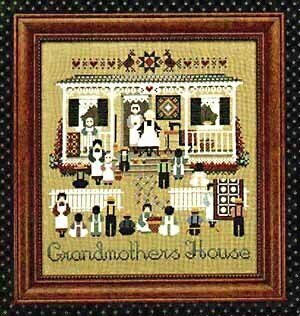 As the wee maid dimpled and answered me.. "Why, I'm making a sampler, don't you see?" 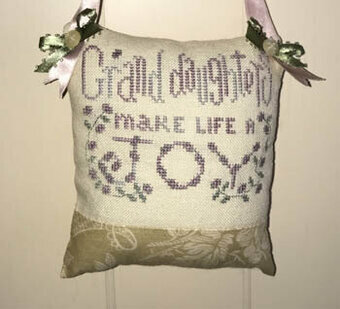 And I wouldn't wonder a bit, some day, if a sweet little girl might feel proud to say: "That was made a long, long while ago by my own great-grandma! Me, you know!". Model stitched on 28 Count Lambswool Linen with DMC floss. Stitch count: 229W x 294H. All models are stitched over one thread on 28 Ct. Vintage Meadow Rue linen with Gentle Art Sampler threads and DMC #12 pearl cotton. Finishing insructions are included. 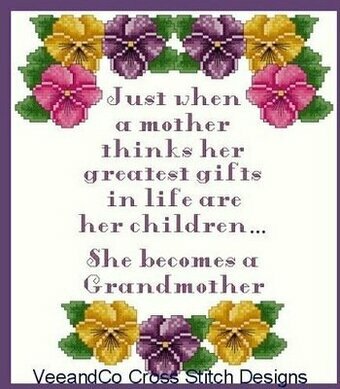 "An angel says Grandparents sprinkle stardust over grandchildren." Model stitched on 28 Ct. Antique White Jobelan with DMC floss, Classic Colorworks floss, and Gentle Art Sampler threads (or all DMC 209, 211, 334, 931, 948, 3708, 3816, 3833, 3756, 612). 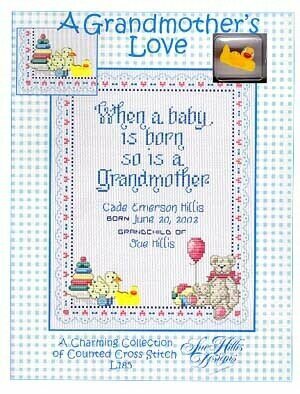 Stitch Count: 47W x 54H. Stitch Count: 78W x 78H.